The Star Wars Trilogy Special Edition was a theatrical anniversary edition of the original trilogy that celebrated the 20-year anniversary of the release of Star Wars: Episode IV A New Hope. During the same year, Topps released a special edition retail set of Widevision cards. 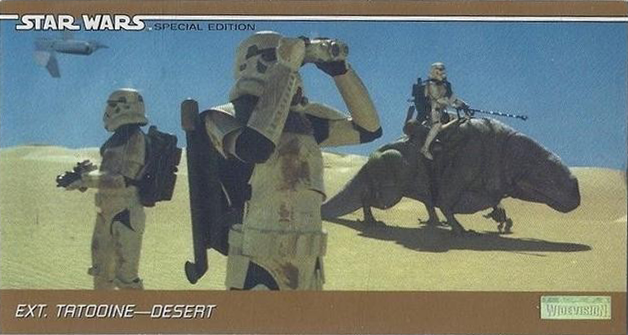 This set of 72 cards was evenly divided to showcase scenes from each of the original 3 movies. In addition to the retail set, there was also a special edition hobby set release. 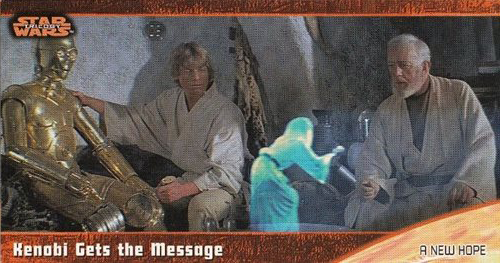 While the retail set shared the glory between all 3 original films, the special edition focused primarily on Star Wars: Episode IV A New Hope and featured a gold foil 'widevision' stamp in one corner. Hence, this set is referred to as the "Special Edition" set and the retail version featuring cuts from all 3 trilogy movies was referred to as "The Complete Story".